New monthly water use data for California water utilities shows that residential water use varies widely around the state, and that the response to the drought has been uneven. Moreover, in some areas, residential use averages more than 500 gallons per person per day, indicating that we could be doing much more to save water. In July, the State Water Resources Control Board, or the Water Board, issued an emergency regulation to increase water conservation in urban areas. The new regulations prohibit certain water uses, like washing driveways and sidewalks, and imposed new restrictions on outdoor irrigation. Additionally, water utilities are now required to submit monthly reports on water use, including a comparison to how much water was used during the same month in 2013. Last week, the Water Board published the latest monthly water use reports for 397 urban water utilities. While a handful of utilities failed to report on time, those that did report cover about 99% of the state’s population. 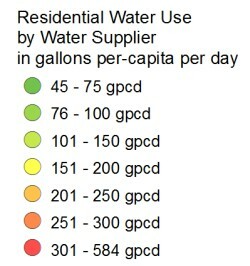 Each water utility reports per-person water use in terms of gallons per-capita per day or “gpcd” and the portion used by residents in and around their homes. The result is a first of its-kind compilation of monthly water use data for urban water utilities in the state. And while officials cautioned that many factors affect water use, these data, displayed on the map below, reveal a number of interesting patterns and trends. Click on a utility’s service area to view a chart of residential water use, and how it compares to the same month last year, and to the average use for the state and its Hydrologic Region. We mapped water suppliers using information from the California Department of Public Health’s Drinking Water Systems Geographic Reporting Tool, supplemented by our own research. Where a water supplier serves a large, mostly rural area, we identified populated areas within the service area. Perhaps the first thing you notice is the large range in reported water use. Residential water use in September 2014 ranged from a low of 45 gpcd in Santa Cruz to a high of 584 gpcd in areas served by the Santa Fe Irrigation District in San Diego County. Water use tends to be lower in the cooler coastal region, and in denser, urbanized areas. Likewise, water use tends to be higher in hotter, drier regions, and in suburban areas with more outdoor landscaping and lawns. 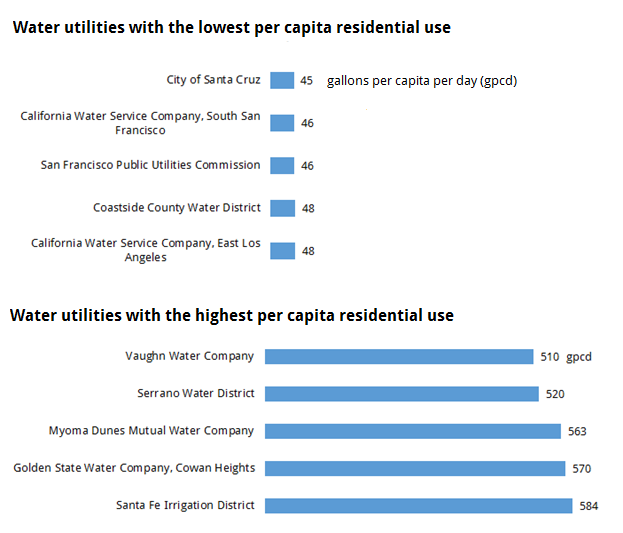 The chart below highlights utilities with the five highest and lowest residential per capita water use rates in the state. The data also show that conservation efforts have been extremely uneven around the state. In January, Governor Jerry Brown declared a state of emergency and called on Californians to reduce their water usage by 20 percent. To date, conservation efforts have fallen short of the governor’s target, despite the fact that a majority of Californians believe that there is a “serious water shortage.” Water use in September 2014 was down an average of 10% compared to the previous year. In fact, only 40 out of 397 water utilities reported water use reductions of 20% or more. Cities that saw the biggest cuts in water use include San Francisco Bay Area cities of Dublin, Livermore, Menlo Park, and Pleasanton, as well as Santa Cruz, Santa Maria, and Santa Barbara on the Central Coast. For a handful of water utilities, water use actually increased in the past year, despite the drought. Cities that saw water use creep up include East Palo Alto, Crescent City, Gilroy, Lodi, Newport Beach, and Sonoma. And while Californians have made gains in using water more efficiently in the last few decades, these recent data shows that there is still plenty of room for improvement. Statewide, residential water use in September averaged 125 gpcd. A recent analysis by the Pacific Institute showed that an average Californian living in a home equipped with widely-available water-efficient appliances and fixtures would use about 32 gallons per day indoors. In addition, many Californians could reduce their outdoor water use by 70% or more by landscaping with low water-use plants. International experience demonstrates that such dramatic savings are possible. For example, Australian households use an average of 54 gpcd for both indoor and outdoor uses, and residents of the Australian state of Victoria use only 40 gpcd. The Aussies weren’t always water misers, but decreased their water use dramatically in response to a decade of drought. Similar changes are underway in California, but should be accelerated. For example, turf removal or “cash for grass” programs are enjoying huge popularity around the state. Replacing lawns with California natives or Mediterranean plants has a host of benefits beyond water savings: colorful blooms that attract birds and pollinators; ease of maintenance; and less need for fertilizers and pesticides. Other efficiency improvements are also possible, such as finding and repairing leaks and upgrading toilets, clothes washers, faucets, and showerheads to water-efficient models with a WaterSense or Energy Star label. We will continue to monitor the latest data from the Water Board to gage drought response around the state and look for interesting trends and new ways to visualize and understand these data. What do you notice when you look at these numbers? My contribution to the the drought problem would be to offer this solution. The problem with brown lawns and drought resistant landscaping is that it changes the microclimate where we live. Lack of greenery actually makes it hotter and we need more air conditioning. Those beloved cactus gardens leave large patches of uncovered soil. We are getting large amounts of particulate matter in our air. For people with asthma and cardiovascular conditions, the state of California is becoming inhabitable. My solution is to look at the whole picture. Overpopulation is a word we haven’t heard in a long time. The baby makers have come back in full force. It’s time to get out the birth control. Since 80% of water usage comes from the agriculture business, it’s time to hang up the plow and stop growing the worlds vegetables in this state. We can’t. There is no water. Almond farms can become solar power farms. When it comes to the urban areas, we need MORE green space, not less. The answer is so simple. If people are going to continue to live in what used to be the most coveted state of the union, we have to think differently about our urban areas. It’s time to use those bare patches of soil and grow our food. We can have potatoes by our front porch, tomatoes on our roof, bring back the orange trees we cut down in the 1960s to build tract homes. We can prevent water waste from people hosing off their driveways by removing the concrete that reflects so much heat and makes our cities hotter and dryer. For those who don’t have time for all of this, they can provide a business for a new kind of gardener. A gardener that grows plants, not cuts them down. The farmers can sell their property to the solar farmers, move to the cities and provide their skills for individual homeowners. Fact 1): Lake Pyramid, just north of L.A. County is the fullest it’s ever been. You cannot even see the waterline from previous dry spells while Castaic Lake just below it is at the lowest level I’ve ever seen in 30 years. The point is, Castaic Lake is not low due to lack of water but due to political decisions to keep it low instead of filling it with water from Lake Pyramid. Fact 2): According to an interview of Mr. Gary Breaux on C.N.B.C by Jane Wells, (June 01, 2015), Metropolitan Water District Chief Financial Officer serving over 19 million people, stated that “80% of the water cost is fixed just to have the water available and does not go up due to water use…the fact is that reduced water use will lead to decreased revenue for the water district and result in increased unit price in the future to make up for the decreased revenue…” In other words, most of our water cost is not due to increased home water use. Fact 3): 80% of the water in California is used by farmers and only 20% is used by homeowners. However, 90% of the produce grown by farmers in Cal. are sold outside of Cal. to other states and even other countries. What this means is that 90% of the water Cal. homeowners give up and subsides through taxes for farmers to grow produce is used to give profits back to farmer’s pockets by selling their produce outside of Cal. Why should Cal. taxpayers and homeowners pay the increase in water costs so that farmers can sell 90% of their produce outside of Cal. and pocket the profits? Fact 4): Tiered pricing is illegal according to a recent court verdict in a case which took place in San Juan Capistrano. According to Cal. state law, a government entity, being funded by taxpayers moneys, cannot charge taxpayers more than the cost of procurement for any goods they purchase. In other words, if it costs the state $.01 per gallon, they cannot charge $.01 per gallon for the first 100 gallons and $.015 for the next 100 gallons and $.02 for the third 100 gallon according to the increased use by a homeowner, since the government entity itself has not paid more for the additional second and third 100 gallons. Homeowners of Cal. need to unite and file a joint complaint and vote out the current Water District politicians and demand that changes be made accordingly. We should not be made to pay from our hard earned dollars, to compensate for the mismanagement of the politicians and water district supervisors! Some of Carol’s ideas are good – reuse infill sites. Very good. Part of Carol’s reply is typical of those who “were here first”. Since the capitalist economy is consumption based, the economy will collapse if no growth/no birth people prevail. And the US will only survive if it continues to be able to exploit weaker economies where wages are low and environmental regulations do not exist. First it was Japan. Then rest of Asia and China. Now Vietnam and the Indian subcontinent. Where next? – In suburban areas, where the land use is not designed for biking, walking, but to keep “those people” as far as possible, the environment is both heavy on water and energy consumption. One can multiply the the number of people occupying a typical suburban McMansion with a low-rise townhouse/flats, and consume even less water and energy. – I live in a relatively dense neighborhood – use less than 30 gal/day INCLUDING watering my drought tolerant plants (no cacti). The neighborhood has most amenities and needs that I can walk for nearly all errands – and have choices on top of that. – We can’t tear down the suburbs. But we can stop building more of the same. And redesign those that are already there. – The CA tax structure (sales, utility, property, etc.) should be consumption based. Progressively higher taxes for consumption of anything – including water, power, gas, land. It will only lead to efficiency. Maybe it’s time we all start thinking of low water consumption gardens. How many times a day we spend in the garden anyways. We are retired and try to conserve water but my wife likes her flower garden. we were using buckets to carry bath and shower water outside then we started siphoning. we use the siphonaid.com which is inexpensive and better than buckets. the building dept told me it was legal so that’s not a problem. Hi I am doing a project on water consumption in California. I was wondering where you got your information and whether I could have access to your API please. I would really appreciate it for my school project.